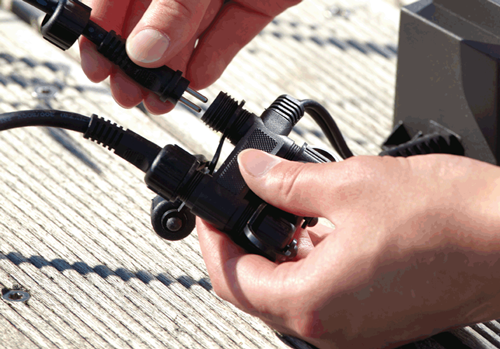 Cable systems and control options for use on the Plug & Play LED garden and pond lighting systems. Timers, cable splitters, extensions and remote controls. This department contains our range of plug & play connecting cables and control options. The cable range consists of weatherproof main cables with multiple lighting connection points, extension cables and cable splitters, all of which can be connected throughout the garden landscape. You should base your selection on the number of lights you have, the distance between the lights, and the location of the power source. All connectors simply screw together and the terminals are fully weatherproof once tightened. For control of the system, we also supply timers with light sensors and remote controllers which can be used to control the entire system, or individual spotlights, depending on whereabouts on the circuit they are installed.